A pilot has denied claims he was in control of the jet that crashed on to the A27 in Sussex during the Shoreham Airshow, killing 11 men. Prosecutor Tom Kark QC told Andrew Hill video showed him looking around and "in constant control" during the flight. 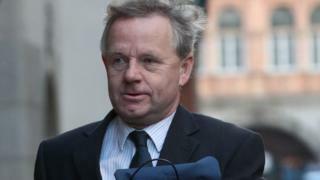 Mr Hill, of Hertfordshire, who denies 11 counts of manslaughter by gross negligence at the Old Bailey, claims he suffered cognitive impairment. The 1950s Hawker Hunter plunged to the ground and exploded on 22 August 2015. Cross-examining, Mr Kark showed the video of the 2015 flight alongside a recording of a similar display in 2014, also at Shoreham. Mr Kark said the video seemed to show Mr Hill looking around and carrying out checks, adding: "You're clearly looking around at the terrain below your aircraft." Mr Hill, 54, replied: "I have no idea what I'm doing on this occasion." Mr Kark also said there did not seem to be any "involuntary movement", adding: "All of this time you are deliberately controlling the aircraft aren't you?" Mr Hill, of Sandon, Buntingford, said there did not seem to be "any sensible control movements". Comparing the videos, Mr Hill told the court: "In Shoreham 2015, I look curiously relaxed and sitting in my seat, which is not my way...I'm leaning back and looking rather casual. "In 2014, I'm leaning forward and looking around." Re-examined by his defence counsel Karim Khalil QC, Mr Hill was asked to expand on his seat posture in the 2015 display. He said: "In Shoreham 2015, there's a strange look down, then I look up and seem to relax back into my seat. "I've got an important manoeuvre coming up. Relaxing is not normally something I do in a display." The court has heard tests and scans afterwards did not show any sign of a medical condition, including cognitive impairment, which may have affected his health leading up to the crash.